I’ve been feeling rather subdued and introspective today. Maybe I’m a bit depressed. Sometimes it’s hard for me to tell the difference. The depression sneaks up on me occasionally, but It doesn’t usually visit for long anymore. In any case, my head is thinking lots of thoughts. They are all floating and bumping around in there like helium filled balloons. Starting (and sticking with) this blog has been a wonderful experience thus far. I’ve begun writing again. Creative writing was one of my fields of study in college along with art. Once I graduated, I gave them both up in order to enter the “real world”. It wasn’t a conscious decision. One day led to the next and the graduation respite ended up lasting years and years… I restarted creating art a little over 15 years ago, but it has a struggle for me to comfortably embrace “being an artist”. The writing began again with the start of this blog. I’m going to have to live with the idea of being a writer for a while before I’m comfortable with that title as well. Once again, everyday life experiences will spark an idea for a story and snippets of some of them have ended up here. Many of those “thought balloons” bouncing around in my head are ideas that I’m playing with – stories that I’m writing and rewriting. It’s time to get some cheap notebooks and start jotting them down so my head doesn’t explode! I know the computer is an easier way, but the artist in me likes scribbled, indented and filled pages of drafts and notes. Thanks to all who have stopped by and shared my rambling journey. There’s some fascinating people in this world! Sharing stories and learning that we are not alone in the journey of discovery and growth is a blessing. Here’s to a day filled with quiet thoughts and sharing. 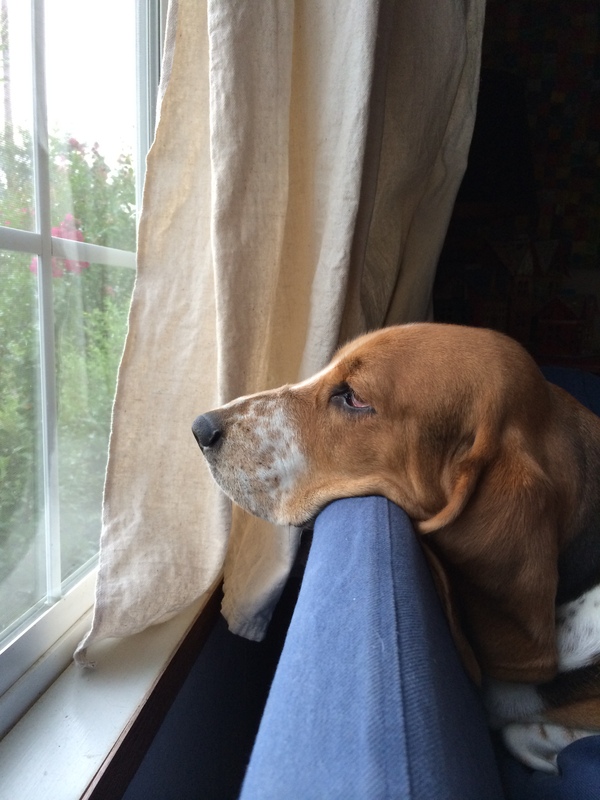 Matilda the Basset thinking deep thoughts.